Mary Katherine's (voice of Amanda Seyfried) father has studied a group of warriors for years. For his research he travels into the woods for hours to survey the little creatures, but one day, when he does not return, the young girl sets out to find her father. While searching she is suddenly shrunk down in size, and stumbles upon the creatures her father has been studying. 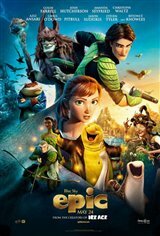 The new animated adventure follows Mary Katherine as she struggles to find a way home and assist her new friends in a war against the evil Boggans.